Lamb kleftiko is an easy, rustic, traditional Greek dish made with lamb, cooked in the oven wrapped in parchment paper. “Ofton” comes from an ancient Greek word, which means baked and “Kleftiko” means stolen. This dish comes from the time of the Greek revolution, when bands of Greek guerrillas, called Klephts, hid in the mountains. In order to survive, the klephts would steal a lamb or a goat from a flock as it grazed on a hillside. The thieves would cook the meat over many hours in a hole in the ground, with red hot stones and glowing embers, sealed the hole with soil so that no steam could escape to give them away. They would go on their missions and come back after hours to find a cooked meal. No other ingredients were added except maybe some salt or herbs, if they had any. In more recent years, kleftiko was traditionally baked in wood-fired ovens, which almost all households in the villages use to have in their yards. In rural places where houses still have a yard, most houses still have wood fired ovens. My mother used to cook it in a large terra cotta pot in the oven, always using aged stock, which slowly cooked for hours. She would also add some potatoes and sealed the lid of the terra cotta dish with a paste she made, by mixing flour with water, covering the sides of the lid with this batter so that the steam would not escape and cook it for at least three to four hours in the oven. Nowadays not everybody has wood fired ovens or clay ovens, so a more modern adaption of this dish is to cook it wrapped in parchment paper, over an aluminium tent, or use a Dutch oven or a casserole dish with a lid. I have enriched this dish by adding more vegetables and herbs, which makes it even tastier and you get a side dish as well, with all the vegetables. If the lamb comes with caul fat, wrap the leg with it as this melts, adding more flavour to the dish. It’s a lovely Sunday dish, as it is very easy to prepare and you don’t have to slave in the kitchen for hours watching over the meal. Although this is not the traditional way of cooking lamb kleftiko, some times I also marinate the meat, which adds even more flavour. Wash the lamb or goat (as well as the caul fat, if any). Put the meat in a container with a lid and add all the marindate ingredients. Rub the meat with the marinade ingredients. Put the caul fat, if any over the meat. Marinate it overnight in the fridge or for at least a couple of hours before cooking, so as to absorb all the flavours. If some of the members of the family do not like a certain ingredient in the recipe, then you can cut the meat into portions and make indivicual parcels, leaving out the ingredients they do not like. Cut two square pieces of parchment paper, about 30 x 30 cm, for each pouch and put them in such a way to form a star. Arrange the meat and vegetables on the parchment paper and distribute the marinade ingredients on each one. Bring the paper over the meat and roll up the unsealed edges to form a pouch. Hold the parchment paper from the edges, just above the meat. Use the kitchen string to tie it tightly. Place them into a roasting tin. When cooked, cut the parchment paper under the string and put back in the oven, until the meat becomes perfectly roasted. The above recipe as well as many more are included in my cookbook «Mint, Cinnamon & Blossom Water, Flavours of Cyprus, Kopiaste!»You can find many more Greek recipes in my second cookbook «More Than A Greek Salad». 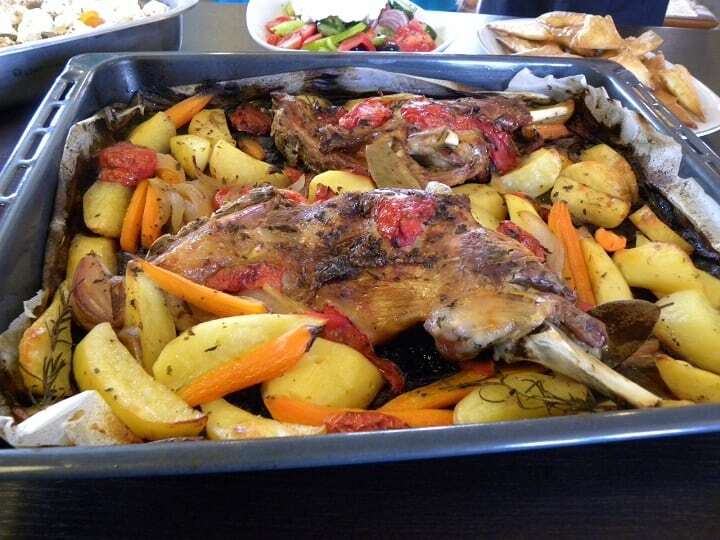 Lamb kleftiko is a rustic, traditional Greek recipe made with slow cooked lamb, first marinated in garlic, olive oil and lemon juice. Wash the lamb or goat and place it in a large baking tin, lined with a big piece of parchment paper. Make slits in the meat and add the garlic. Season with some salt, pepper, oregano, rosemary and add in the bay leaves. Arrange the onions, potatoes, tomatoes and carrots around the lamb and season them as well. Cover tightly with parchment paper and cover the baking tin with aluminium foil, to make sure that no steam will escape. Bake in a preheated oven to 180o C/ 350o F for 2½ - 3 hours. (For aged lamb or goat, cook up to 4 hours). Remove the aluminium and parchment paper and cook uncovered for about half an hour or until golden. Serve warm but the meat it is also very delicious served cold. I really enjoy Kleftiko dishes and “ghida” works well here too!